María Ermelinda Vásquez Ramírez knows hunger and heartache. In 2015, a severe and extended drought caused major crop damage in her community in Chiquimula, Guatemala. The drought hit Guatemala’s Dry Corridor hard. About 1.3 million people who depend on subsistence agriculture—nearly 10% of the country’s population—were facing hunger. Many families, including María’s, resorted to skipping or reducing the size of their meals. For María, life became even more difficult. “Superamos” means “we overcome.” That’s just what María and some of her neighbors are doing with the help of a small card provided by a CRS project. 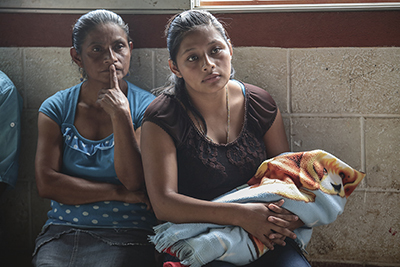 CRS and our partners Caritas Jalapa and Caritas Zacapa created a 6-month emergency response project that provides $3 million in electronic voucher cards and cash transfers to help 5,000 families buy food and other essentials. “The Superamos project allows families to have immediate food assistance. They are given an electronic card. Each family can go to the village shop and receive their food, especially food with a high nutritional value that can help alleviate the acute level of malnutrition in children under 5,” says Gustavo Chew, CRS coordinator for MEAL, or monitoring, evaluation, accountability and learning. Purchasing locally helps stimulate the economy. Participating shops use smartphones to show their inventory so families can see what is available and select the food they want. The women and men who participate also receive education. To maximize the nutritional impact of their monthly benefit, they participate in a series of activities that empower them to jointly make important decisions about household health and nutrition. “During six sessions, they discuss topics about the status of children’s health, pregnant mothers, nutritional issues and hygiene,” Gustavo says. Parents learn to recognize symptoms of acute malnutrition and other illnesses, and how to select food and prepare nutritious meals. With Superamos, María’s children can look forward to the joy of having a glass of milk; and she, to healthier children.